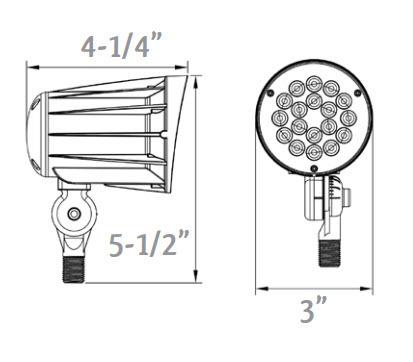 LED 6-watt 12-volt flood light fixture has a familiar compact shape for all types of building and home lighting. This also has a 70,000 hour rated life, far more than other manufacturers. 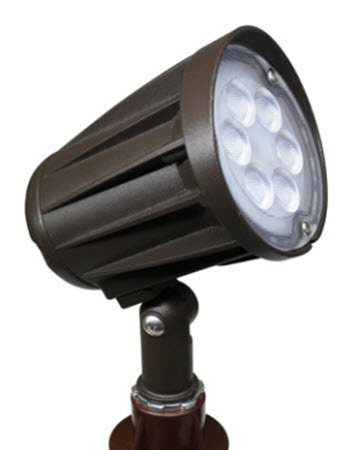 It comes with a 1/2" knuckle spike included, and its small size is perfect for building lighting or home landscape lighting. It operates on 12 volts, and it's suitable for wet locations with has a wide beam angle to cover most any area evenly. And even though we talk about landscape lighting is its primary use, it also has many other applications such as security lighting. Being it can be mounted directly on any junction box it could be used in many other ways. It could provide building lighting and accents or be a straightforward security light providing enough light for a backyard or over a door it's an entirely flexible product that will deliver a lot of light in a tiny package. It's equivalent to about 50-watt halogen MR16 flood light, so you know you're going to save energy while getting the kind of light that you need. It comes in two different light colors, the warmer 3000K and the cooler 5000K versions. If you're a person that likes warm incandescent light, then you're probably going to want to pick the lower color temperature. On the other hand, if you're a person who likes a more natural daylight color, something that's very white, then you want the 5000K version.